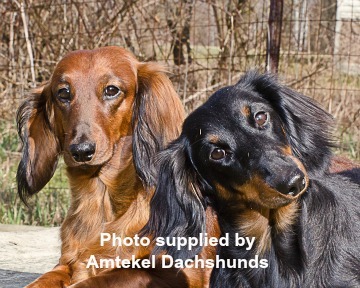 The dachshund personality shows that these dogs have personality plus and charm that wins friends and influences people. Dachshunds now, are not hunters but pets but still remain independent, courageous and clever, they make loving family pets with their own charm and are often the playful clown. Dachshund personality shows that this little dog maybe stubborn, but they are also very smart and intelligent, and if you have established yourself as the boss then they understand about pleasing you. It is a serious fault for a dachshund to show shyness. Dachshunds show great loyalty and affection, when he becomes your friend it is for life, he makes a wonderful companion for adults, and an excellent family pet. Not only are they affectionate but they will demand attention if they think they are not getting enough, Jazz will, sometimes come up and nudge my hand wanting to be acknowledged and patted. Often when guests arrive she will roll over on her back to have her tummy tickled. The more, good, social experiences that Dachshund puppies get, especially with children and other pets the better, always supervise constantly to avoid problems in the early stages. Dachshund’s get along well with children if..
Children know how to treat a dog kindly. The dachshund has a good temperament. Your dachshund puppy has been raised with children. Because they are such social animals, they need to live indoors with their family and do not do well kept outside. They tend to be reserved around strangers, although only a small dog they make good watch dogs with a loud bark, and sometimes bark not only at strangers but at other slight noises and disturbances or perhaps even to get attention. Dachshunds adapt well to city or country life and are suitable for apartments as they are active indoors and do not requires a large outside yard although still need a daily walk and play. But of course it is those soulful eyes and interested alert facial expressions that endear them to everyone. The look I get from Jazz when I put on my shoes and jacket,"can I come too"?